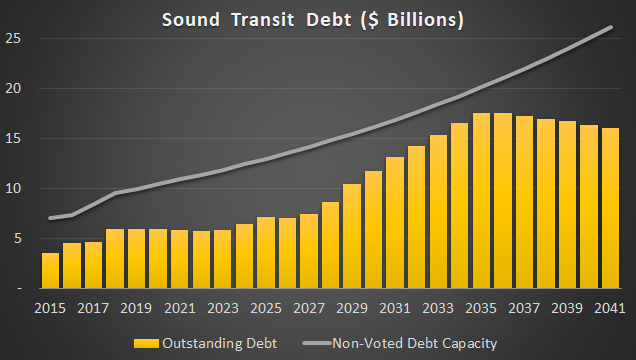 Sound Transit anticipates a steep increase in debt after 2025, approaching statutory limits by 2035. Sound Transit’s ability to take on more debt is constrained both by statute and by policy. Most immediately relevant is a statutory limit of non-voted debt at 1.5% of the assessed value of property within the RTA. This is the same limit all Washington State municipalities face. With 60% voter approval, the statutory limit would increase to 5%, though other policies and bond covenants would prevent the debt ever getting that high. The cushion between actual and allowed debt is most narrow in 2035, when the $17.6 billion in outstanding debt nudges against the $20.1 billion limit. All financial projections over such an extended period are uncertain, combining assumptions about revenue growth, federal grants, project costs, and interest rates many years into the future. The legal debt limit may be lower than anticipated if the growth of assessed property values slows. Some risks correlate in unhelpful ways. Prolonged slower growth would mean lower tax revenues and less ability to borrow to fill the gap. The long-term debt plan is very sensitive to small changes in the financial plan in the early years. Consider the bills to correct MVET valuations. The tax revenue loss from updating the valuation schedule is just $780 million between 2017 and 2028 if there is no other mitigation from the Legislature. The implications for Sound Transit debt are larger. Absent offsetting cost reductions, the lost revenues must be replaced by debt. The average interest rate is anticipated at 4% through 2021 (reflecting low recent bond rates), and 5.3% thereafter (a more typical pre-recession cost of debt). Sound Transit pays a 1% origination fee on bonds and typically begins repaying principal after five years. The principal and interest payments are themselves funded with more borrowing. At those rates, the MVET reduction accumulates to $1.6 billion in outstanding bonds by 2035, or $2.2 billion by 2041. That appears to just fit within future debt limits, but the margin of error is much too narrow for comfort in a decades-long financial forecast. Large five-lane intersections dominate Bellevue. To eke out every little bit of roadway capacity, the city in 2015 finished installing adaptive signal technology at all 203 of its signalized intersections. 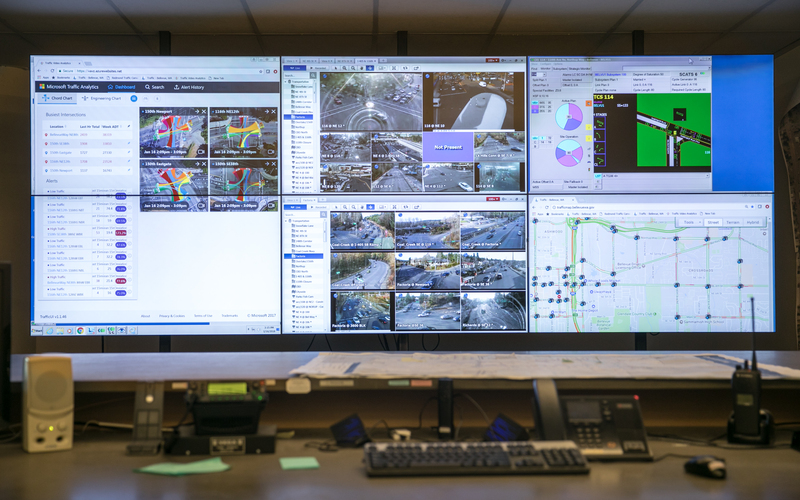 The system adjusts the timing of the traffic signal cycle based on real-time traffic conditions. In theory, the less unused green left at the end of each light cycle, the better, resulting in more traffic moving through the intersection. This system, known as the Sydney Coordinated Adaptive Traffic System (SCATS), has reduced afternoon delays at some intersections as much as 43%, but is also benefiting pedestrian and bus riders, the city says. Traditional traffic signals work on a fixed cycle, which might allow for a couple of settings to be used over the course of the day. But the timing for a traffic signal cycle that works best for the morning commute isn’t always the most efficient for the evening rush or during non-commute hours. Instead, SCATS uses detectors embedded in the roadway to constantly monitor traffic volumes at intersections, adjusting cycle lengths based on current demand. The system tries to decrease delay by reducing the amount of unused green time during each cycle. Generally, the higher the traffic volume through an intersection, the longer the cycle length is to serve the demand. Sound Transit and Metro have released their 2017 ridership numbers, and they paint a rosy picture for our regional transit system amid a national decline in transit ridership (particularly among buses). The two agencies alone carried 155 million total passengers within King County; add estimated figures from Pierce and Snohomish counties and the number of total transit trips taken in 2017 increases to over 190 million. Leading the way is Link, which averaged 72,028 weekday riders and carried 23 million total passengers, an increase of 22 percent over 2016’s huge ridership. Sound Transit’s ridership grew by 10 percent overall, with only a small decline in ST Express ridership holding it back. To put things into perspective, Link is now ~40 daily passengers away from surpassing the Minneapolis–St. Paul light rail system, which averages 72,064 riders on 23 miles of track. Even without the boost from the Northgate Link extension, ridership could come close to – or surpass – Denver’s RTD light rail system, which carries 75,900 daily riders over a sprawling 59 miles of track. More numbers after the jump. A film produced after the TGV‘s first year. The French had self-service ticket vending and seat reservation for its high speed train in 1981! Link operator Kevin Gumke isn’t worried a robot will take his job anytime soon. At least 55 metro lines in 37 cities around the world are fully automated, according to the International Association of Public Transport, an advocacy group that promotes public transit. In response to a successful challenge by a Phinney Ridge neighborhood group over the lack of onsite parking proposed for a 57-unit apartment building, the city is planning changes to the land use and zoning code that would allow the project to continue. The legislation under consideration would change how the city defines “frequent transit service” areas, allowing developers to continue to build apartments without parking in transit-rich areas. The move would also require the unbundling of parking space rentals from lease agreements in buildings with 10 units or more. 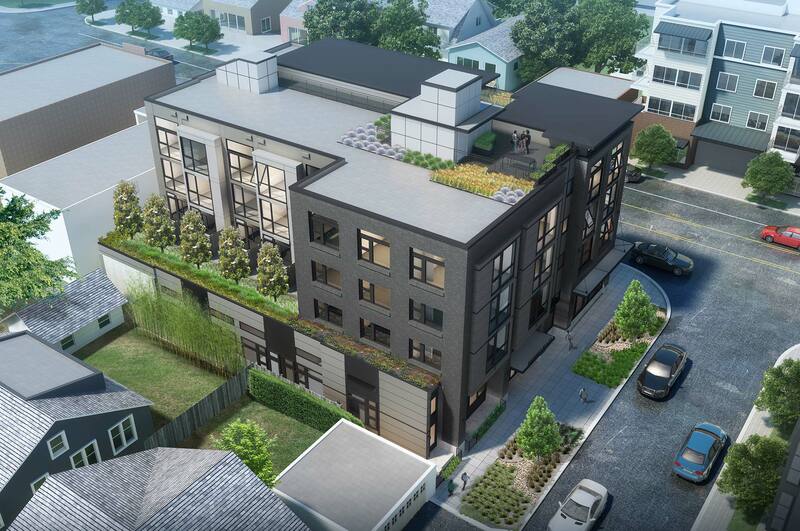 A 2017 hearing examiner’s decision halted plans for an apartment building at 6726 Greenwood Ave., agreeing with the group, Livable Phinney, that the location of the proposed housing units did not meet the city’s definition of frequent transit service and therefore was not exempt from onsite parking requirements. A West Seattle group, Neighbors Encouraging Reasonable Development, has also challenged the city’s definition of frequent transit service. Currently, the city defines frequent transit service as “transit service headways in at least one direction of 15 minutes or less for at least 12 hours per day, 6 days per week, and transit service headways of 30 minutes or less for at least 18 hours every day.” Onsite parking is not required for new buildings within a quarter-mile of areas with frequently-served transit stops. The first HOT lanes (high-occupancy toll) in the region opened on SR 167 in 2008. In 2015, another 15 miles of HOT lanes opened on I-405 between Bellevue and Lynnwood. Throughput on the lanes is maximized with a combination of free HOV-3 and tolling for other vehicles. The former HOV-2 lanes were badly congested as too many vehicles qualified to use the lane, but HOV-3 alone would leave the lanes under-used. Tolling balances traffic by allowing just enough other cars into the HOT lane so it is used efficiently, but not overwhelmed. Raising the HOV limit to three occupants at peak hours, however, did make the lanes unpopular with former two-person carpoolers. In Renton, construction is underway on HOV-to-HOV ramps between I-405 and SR 167. Those will open for traffic in 2019, enabling higher occupancy vehicles to avoid the weave across several lanes of general purpose traffic. 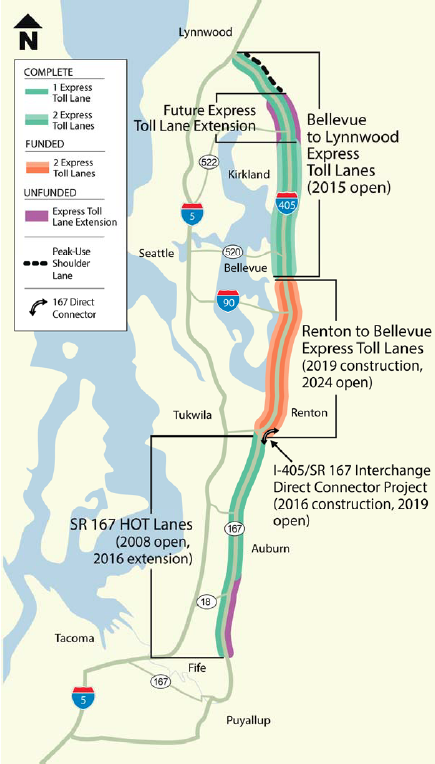 Construction then begins on widening I-405 to create two HOT lanes in each direction between Bellevue and SR 167. A fifth of the $1.175 billion cost is funded from future tolls. Completion of the Bellevue-Renton HOT lanes in 2024 will enable Sound Transit to operate BRT on this corridor. Between Bothell and Lynnwood, the highway narrows to just one HOT lane and two general purpose lanes in each direction. Demand for the HOT lanes is so high that they often fail to clear even with tolls at the statutory maximum of $10. Toll revenues funded a shoulder lane between SR 527 and I-5 that opened in April 2017. That significantly improved operations in the northbound direction, increasing vehicle throughput in the general-purpose lanes and reducing toll rates. The cost was a low $11 million. Future planned improvements in the I-405 Master Plan have higher price tags and currently lack state funding, but could be paid for by future tolling. It is against this background that the continued operation of managed lanes is being debated. All the major Eastside cities, the transit agencies on the corridor, and many large employers, have joined in lobbying the Legislature. They seek continued tolling along the corridor and an expansion of the HOT lanes north of Bothell. Two recent joint letters lay out the interests of local stakeholders. 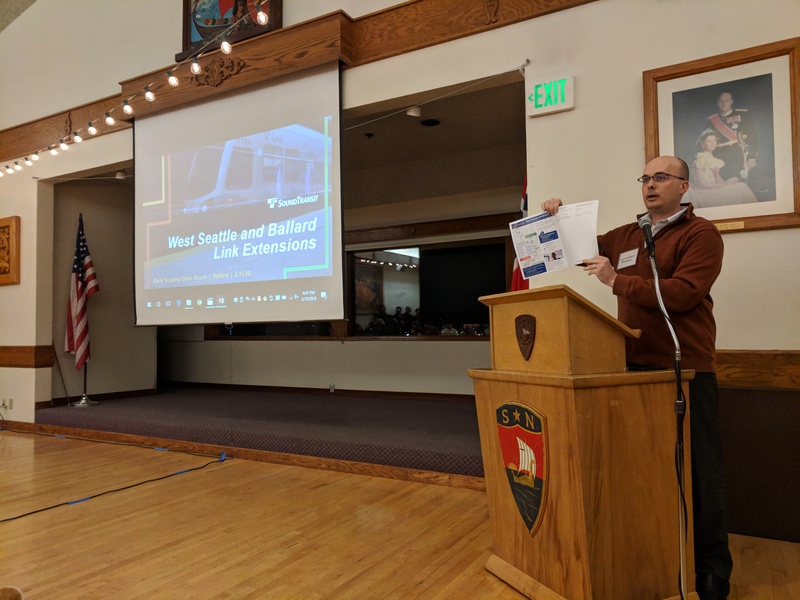 On Tuesday night, Sound Transit put on an open house in West Seattle that was well attended (a little crowded, at that) and seemed to generate good ideas. It had all the standard fare: a looping video of the project alignment; some rollplots with maps that vaguely showed the alignment over some aerial imagery; boards with basic information about the project; a venue with ample parking and a decent bus connection; and an audience of older people who were able to make the 6:00 pm start time by not working downtown. This post isn’t about that meeting, however. This is the 21st century, and it seems like Sound Transit has finally updated the public comment process to suit it. The online scoping open house (which is open until March 5) features a neat comment system that allows you to place notes over an interactive map of the representative project alignment and vote on the comments of others. The comments can be sorted by the number of “likes”, providing a rough way of gauging the popularity of particular ideas, which makes the lives of us bloggers a bit easier. It seems to be a hit too, with over 600 comments generated in the first week of going online. 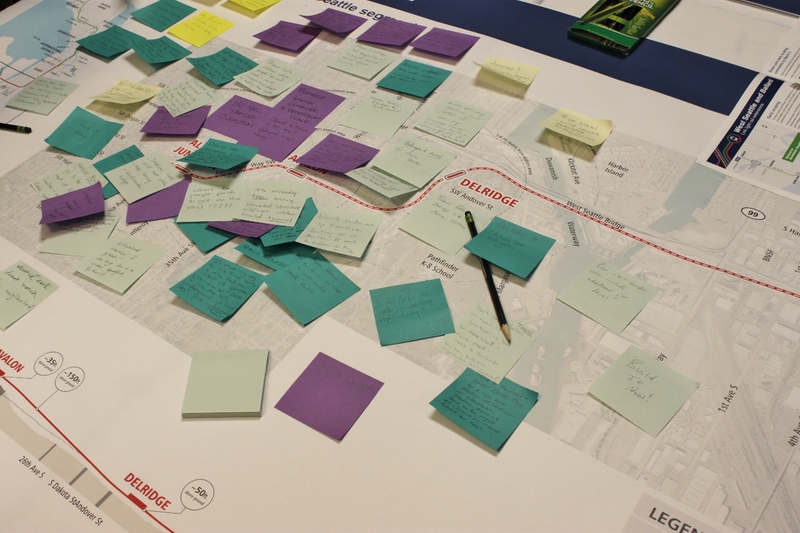 While some of the comments were off-topic, off-kilter, or repetitive, a lot of the more popular comments offered good ideas, including some that transit advocates overlooked while pushing their own agendas. 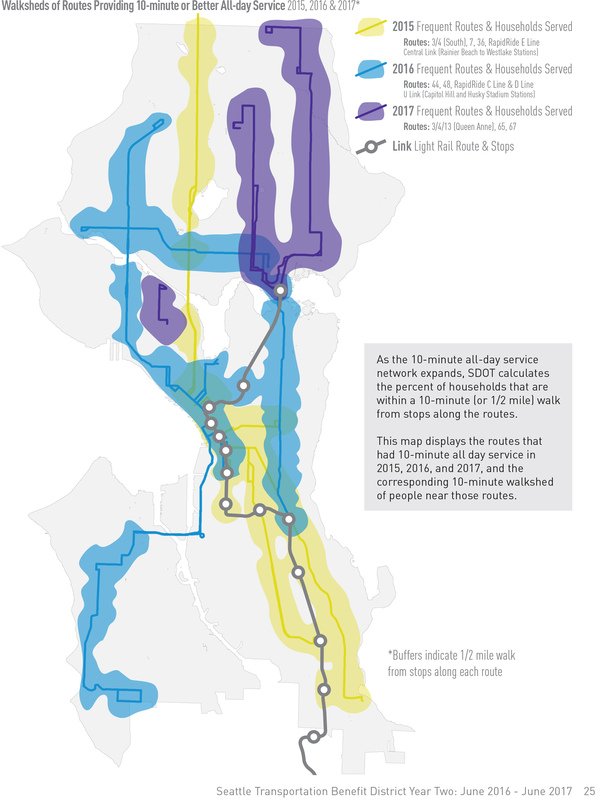 Seattle’s $50M yearly investment in additional bus service has helped deliver frequent transit service to a majority of households in the city. After three years, the percentage of families living near routes with transit service every 10 minutes has more than doubled, SDOT says. 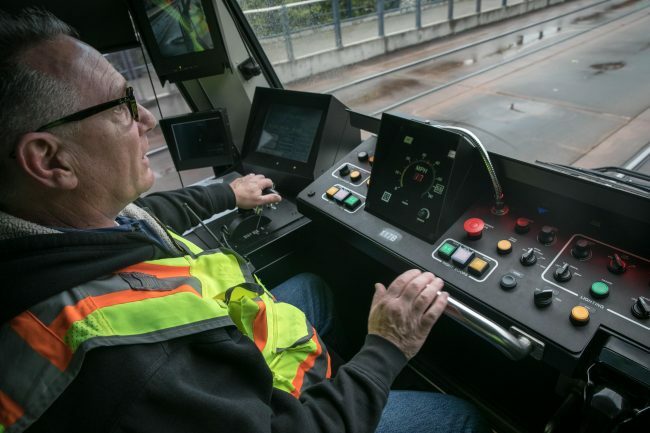 Now a driver shortage could limit the extra service Seattle can buy from King County Metro Transit, as the city strives to bring frequent transit service to even more households this year. In 2014, voters approved Proposition 1, which created the Seattle Transportation Benefit District (STBD) to pay for increased bus service funded by a $60 licensing fee and a 0.1% sales tax increase. The funding increased the frequency of buses and eased overcrowding by adding 270,000 hours of annual bus service to 68 bus routes. Three years later, the city estimates 64% of households are within a 10-minute walk of all-day transit service running every 10 minutes or better, up from 25% in 2015, leaving the city only 8 percentage points away from its 2025 goal of 72% of households. He pointed specifically to RapidRide Lines C and D, which remain overcrowded even as Seattle pays for more than a third of the service for both routes. But a Metro labor shortage might limit the city’s ability to purchase additional bus service. Last week The Stranger published a wide-ranging interview with Governor Inslee, whose stated purpose was to drum up the grassroots for his carbon tax proposal. He doesn’t criticize legislators directly, but you certainly get the impression speaker Frank Chopp (D-Capitol Hill) isn’t exactly out in front of the climate activists. When legislators want something to be a priority, they don’t create arbitrary additional obstacles for passage. See additional Stranger anonymous sources on Chopp here. Perhaps, as leader of his caucus, Speaker Chopp is saying that not all his Democrats are on board, and he won’t force them to take a tough vote. In any case, he certainly isn’t directing the full powers of his office at the problem. This post was updated at 6:20 2.20.18 to include testimony and information from comments. In a disappointing legislative session marked by mostly defensive effort to protect the Sound Transit 3 project list from cuts, there has been one bright light: Engrossed Substitute Senate Bill 5288, allowing Thurston County Intercity Transit to add an additional 0.3% sales tax within its district, if approved by voters. Intercity Transit is currently allowed a 0.9% sales tax, like most other transit agencies in the state, but has enacted only 0.8%. Allowing 1.2% would bring it up to Community Transit’s level, but without being combined with the additional 1.4% Sound Transit sales tax that applies in the CT district. IT gets 63% of its revenue from sales tax. Nearly 5 million boardings are served each year, at a cost of $45 million in operating expenses and $33 million in capital expenses such as fleet renewal. The additional revenue it could get for the 0.3% extra sales tax is estimated at $18.1 million annually. Intercity Transit has had to take on most of the burden for transit service between Tacoma and Olympia in recent years, as Pierce Transit and Sound Transit have eliminated Thurston-Pierce inter-county service. IT operates routes 603, 605, and 612 between Olympia and downtown Tacoma, and route 620 between Olympia and Tacoma Mall. Intercity Transit also operates a free shuttle serving downtown Olympia and the Capitol Campus. The shuttle has 12-minute headway much of the day. The only other IT routes with headway better than half-hourly are routes 13 and 41, each with 15-minute headway during their peak periods, and half-hourly off-peak on route 41. Some combined corridors provide scheduled 15-minute all-day headway. Intercity Transit’s budgets and strategic plans are available here. 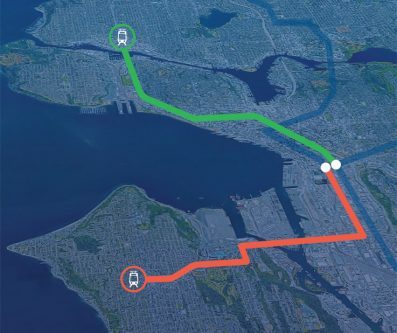 A look at the preliminary project alignment for the West Seattle and Ballard Link extensions, shown by Sound Transit at the recent open houses for the early scoping process. Online comments are still being accepted at wsblink.participate.online until March 5. 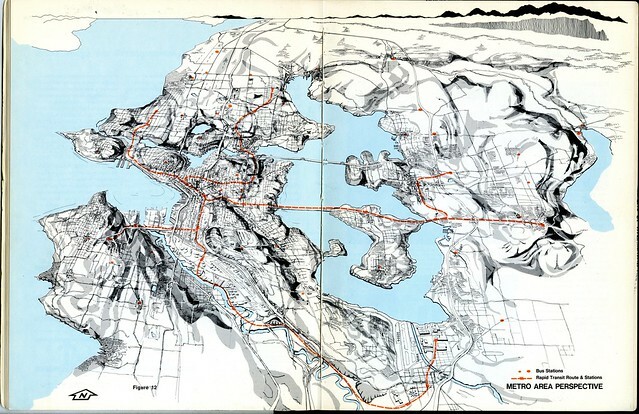 Fifty years ago this week, February 13, 1968, 50.8% of Greater Seattle voters voted yes to the Forward Thrust rapid transit proposition. The construction of a 49-mile rapid transit system modeled after BART and the Washington Metro needed voters to approve $385 million in general obligation bonds. The remainder of the $1.15 billion cost would be picked up by the federal government. Unfortunately, the state constitution requires a 60% majority to approve such a bond so the measure failed and the rest is history. But for the sake of this post, let’s assume it did pass and the system got built as planned. What would a Metro map look like? We’ve seen the scans of maps from the plans. What we’ve not seen is how the service would have operated. Here is a diagram I made that presents the Seattle Metro rapid transit system as if it were in operation in 1990, five years after completion of the initial system plan after several phased openings than began in 1976. I wanted to create a map with a 1970s design aesthetic but not clone the style of those iconic transit maps of the era. As Seattle is entering the “period of maximum constraint,” with downtown becoming even more inundated with construction projects, more workers in that area are leaving their cars at home and riding transit. Last year, the drive-alone rate hit an all-time low of 25% of downtown commuters, even as 15,000 jobs were added to the area, according to the 2017 Center City Modesplit Survey. Nearly half of downtown workers instead chose to take the bus or train to their jobs. Adding employees traveling by foot, bike or carpool pushes non-single-occupancy vehicle commute rates above 70%. Despite a 5% drop in the share of SOV commuting between 2016 and 2017, the share of transit ridership grew by only 1%. Instead, some former drivers were choosing to walk or participate in a carpool. “Transit works, and we need more of it as quickly as possible. From working with employers to increase telecommuting to speeding up light rail, we can expand our transportation options that make it easier and safer for Seattle residents to get around,” said Seattle Mayor Jenny Durkan in the press release accompanying the report. 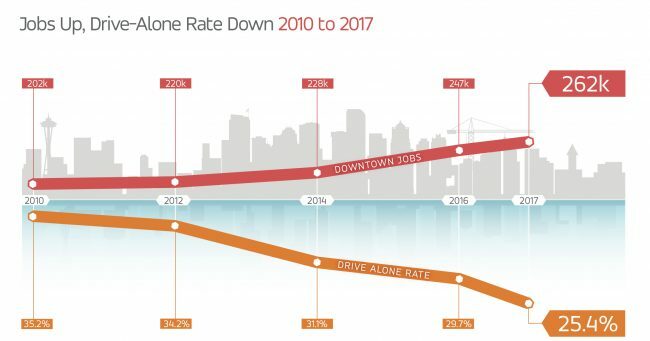 Rates of drive-alone downtown commuters have steadily declined since Commute Seattle began tracking travel trends in 2010. Over the last seven years, as 60,000 jobs were added in the downtown core — an increase of 30% — transit usage among commuters has steadily grown, up by 6%, while the drive-alone rate decreased 9%. Commute Seattle attributes the decline in driving alone to the voter-approved $50M yearly transit investment from the Seattle Transportation Benefit District, efforts from employers to discourage driving alone and new housing downtown, enabling people to walk to work. 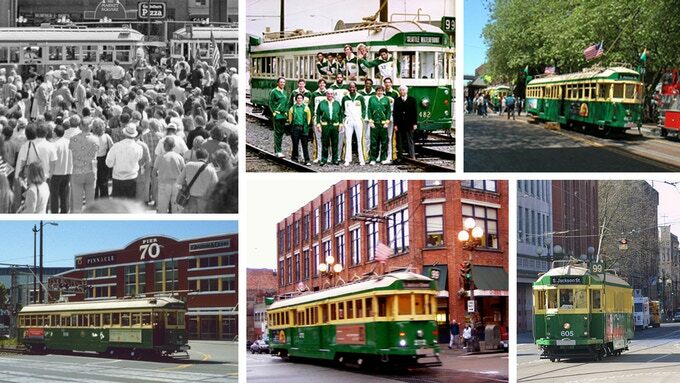 You know a city becomes mature when its citizens begin to celebrate their transportation history. London, New York, San Francisco: these are all cities that have been pioneers in the field of transportation and have all embraced their own unique histories of moving people and goods. Seattle is one such city—and while we are probably best known for pioneering the way people travel the globe by plane, our massive rail network of streetcars in the early part of the 20th Century was really quite remarkable. This network shaped the character of our city and provided critical access to the collection of neighborhoods we have today. And even though these streetcars were removed and replaced by “trackless trolleys”, their threads remain woven into our urban fabric and are still visible in the City we live in today. Thursday, the Sound Transit Capital Committee approved funding for project development for two bus rapid transit routes. 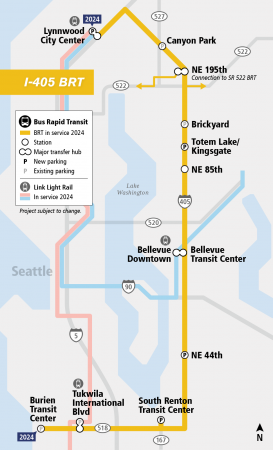 As part of the ST3 package, the projects will add 45 miles of BRT to the region. One BRT route will run between Lynnwood and Burien along I-405 and State Route 518, with 11 stations in between. 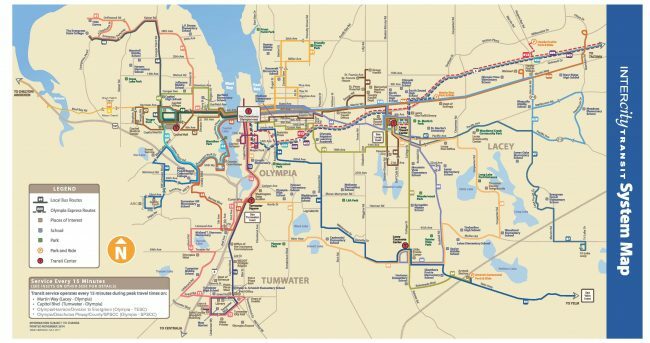 The other future BRT route will connect Woodinville and Shoreline along SR 522, with nine stations serving communities on the northern tip of Lake Washington. Both are scheduled to open in 2024. ST anticipates bringing preferred alternatives for both projects to the board early next year, with final designs selected by 2020. 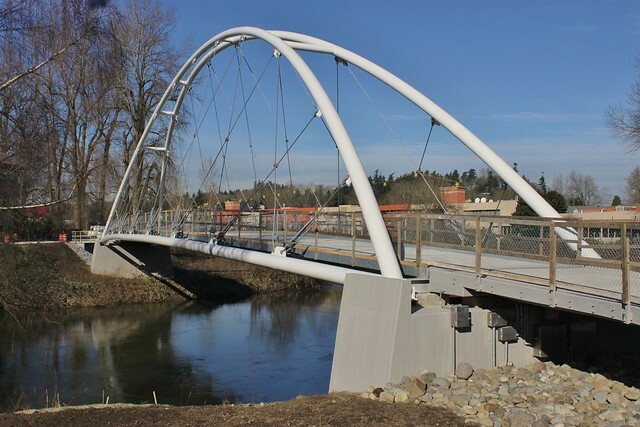 As part of community outreach, an elected leadership group, comprised of elected officials that represent the service corridor and the Sound Transit Board, will convene for the planning process. Elected leadership groups are charged with reaching community consensus over key project decisions and recommending a preferred alternative to the Sound Transit Board. To keep the “rapid” in bus rapid transit, ST says its planning to implement all-door bus boarding and off-board fare payment options along the two lines. Buses will be branded for easy identification — similar to the distinctive branding King County Metro Transit gave to its RapidRide lines. To support the lines, a bus base and operation and maintenance facility will be built in Bothell, where the two lines meet. The BRT buses will run 19 hours a day, Monday through Saturday, and 17 hours on Sundays. ST is considering using electric buses for the routes. 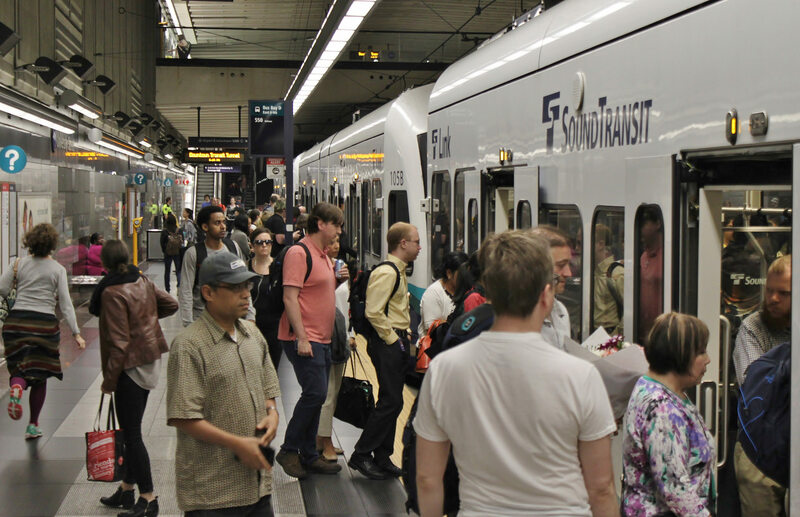 This week Sound Transit is kicking off ST3 planning for the Ballard and West Seattle Link extensions with community meetings in West Seattle, Ballard, and Downtown Seattle. 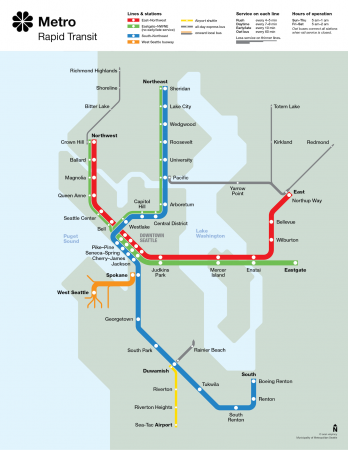 The basic alignments have been chosen, but there are still a lot of big decisions to be made before Sound Transit selects the preferred alignment for each segment. When building out a multi-billion dollar system, the worst thing we can do is make planning decisions that damage people’s trust in the system. A great system gets you from point A to point B in about the same amount of time, every time. It gives the system a huge advantage over unreliable and frustrating traffic. As we noted in an earlier post, a drawbridge that can hold up trains or get stuck is a feature we shouldn’t be considering for our massive investment. A high static bridge or a tunnel are both better options. A high bridge would be amazing to ride and would not increase costs of the project. A tunnel would have fewer construction impacts and would facilitate a slightly better station location, but would cost $600M more. The draft plan adds an additional at-grade crossing at Royal Brougham near Stadium Station. The combined frequency of current and future 4-car trains will create a dangerous situation where cars will be more likely to “risk it” to get through the intersection. Crashes will potentially shut down the entire system for hours at a time. Either Royal Brougham needs to be vacated for auto traffic or Link needs to be elevated at that point. This needs to be decided in advance. A few years ago, some activists thought to start a group to urge aggressive expansion of the Seattle-area transit system. And guess what…it worked! But let’s face it. 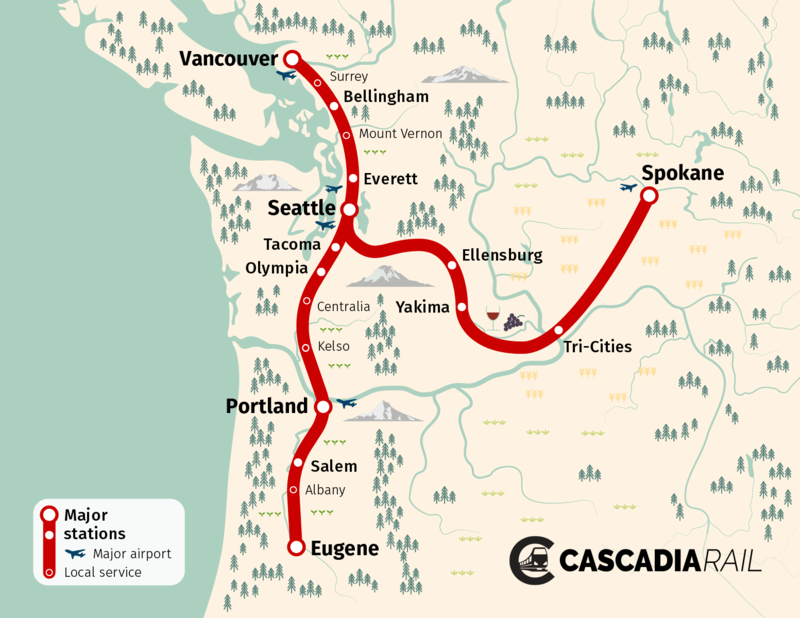 Because our entire region is popular and globally competitive, more is needed to support the growing population across the Cascadia region (combined metro populations of 13.5 million in 2040, up from 10 million today). Every time a mom or a dad spends ninety minutes on a 35 mile commute between Tacoma & Seattle, or 5 hours just to get to Portland, we know something is wrong. WE. DESERVE. FASTER. Our quality of life, and of our children’s lives, depends on it.